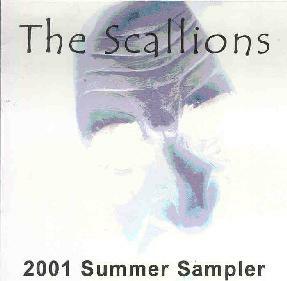 The Scallions - "2001 Summer Sampler"
As you read the printed musical description "Avant-Garde Power-Pop" on the back of The Scallions' CD cover, you may immediately approach the group's set of music with a sense of humor. Rarely, if ever, do you encounter music that is composed of two strikingly different and seemingly opposing genres such as "Power-Pop" and "Avant-Garde" especially when the musicians' goals are apparently not ones of sound collage. Before listening to the CD, a likely thought is that the group has made an attempt to blur the lines between genres. With that said, those who get an opportunity to listen to The Scallions' self-titled CD sampler would probably find all six of its songs average at best. It's obvious that the CD was not created to challenge old ideas of music in order to create new ones. The first and last track on the disc will probably be found to be the most interesting, though still failing in actual creativity. The first song "2" has emulated sounds of guitar and apparently saxophone; the last track "Innocence Denied" does a similar thing but leaves out the saxophone this time around. The fifth track "Falling" is definitely different from the rest of the sampler as it comes off as a heavily synthesized/distorted guitar wailing about. Unfortunately this will not be a Fred Frith sound you'll be witnessing but simply a track drenched in sounds that appear to come from a good sound effects card for a studio keyboard along with a mechanized voice repeating the word falling throughout a 1:37 track. Basically, you have the 70s group the Raspberries without live instruments and all replaced with MIDI keyboards trying to assimilate an "experimental" sound into their repertoire at times. If this sounds in the least bit interesting, then maybe you may find comfort in some of The Scallions' music. For more information you can visit the Scallions web site at: http://www.thescallions.com. The Scallions; c/o Shawn Franklin; 7-B2 Concorde Way; Windsor Locks, CT 06096.